Panelist Credits Tracking is used in SIMS Sensory Quality Panel Software to Track Credits/Rewards for Panelist Test Activity. Credit Tracking has been designed to allow you to maintain a fully functional TRANSACTIONS-based series of Transactions. Panelist Rewards! This was a BIG enhancement to SIMS. Easily assign panelist credit "value" when you start the test, your panelists will get automatically credited, optionally do the debit also or add credits to running balance. Optionally enter any transactions you need. 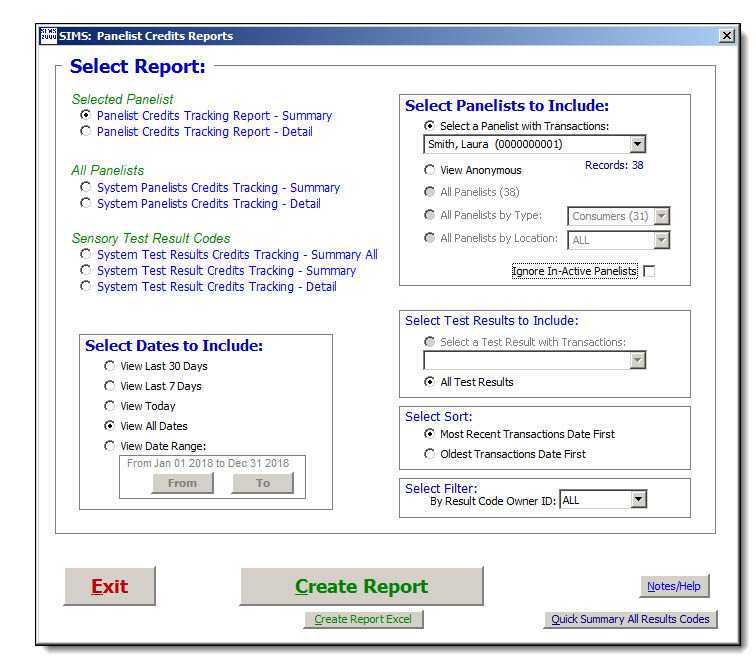 Flexible Reporting for specific Tests, specific Panelists, or System-wide. SIMS Exports to Microsoft Excel. Panelists detailed transactions reports. SIMS Exports to Microsoft Excel. on the SIMS TEST RESULTS, TEST Parameters Screen when the test is started. 1) Test Credits to Panelist, and 2) offsetting Debit entry. Use this option to give coupons/reward/etc. IMMEDIATELY to Panelists (Time Saver for you). 3) Panelists have to START a test and answer at least one question to get credit. into a single 'virtual' Panelist Code. sites do not want panelists to see this. Anonymous Panelists will never be able to see a Balance. or edit Panelist Credit transactions. along with the optional 'DO DEBIT ALSO' entry discussed above. All other transactions are the responsibility of the SIMS technician. 1) Panelist Credits Tracking Report - Summary, for a given panelist, all transactions. Totals for Test Credits, Debits, and Balance. Filtered by a user specified date range. 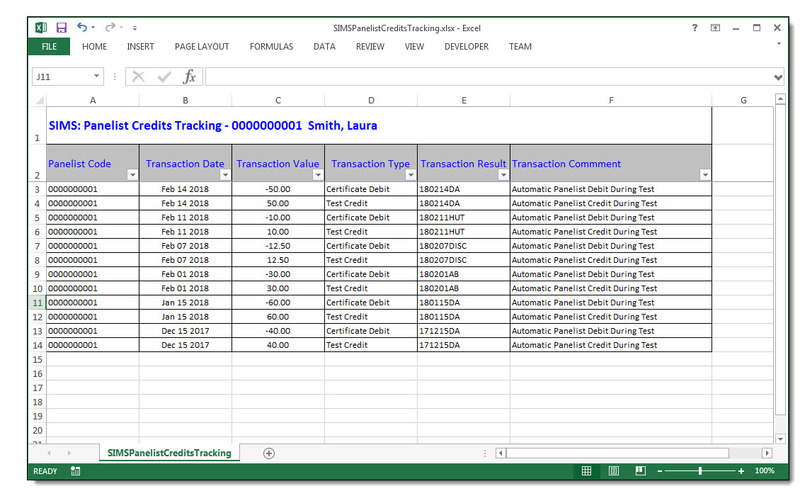 2) Panelist Credits Tracking Report - Detail, for a given panelist, all transactions. One line per transaction. Totals for Test Credits, Debits, and Balance. 3) System Panelists Credits Tracking - Summary, for all Panelists grouped. Totals for Test Credits, Debits and Balance. One line per panelist. Totals for Test Credits, Debits, and Balance. 5) System Test Results Credits Tracking - Summary ALL, for all SIMS Test Result Codes. 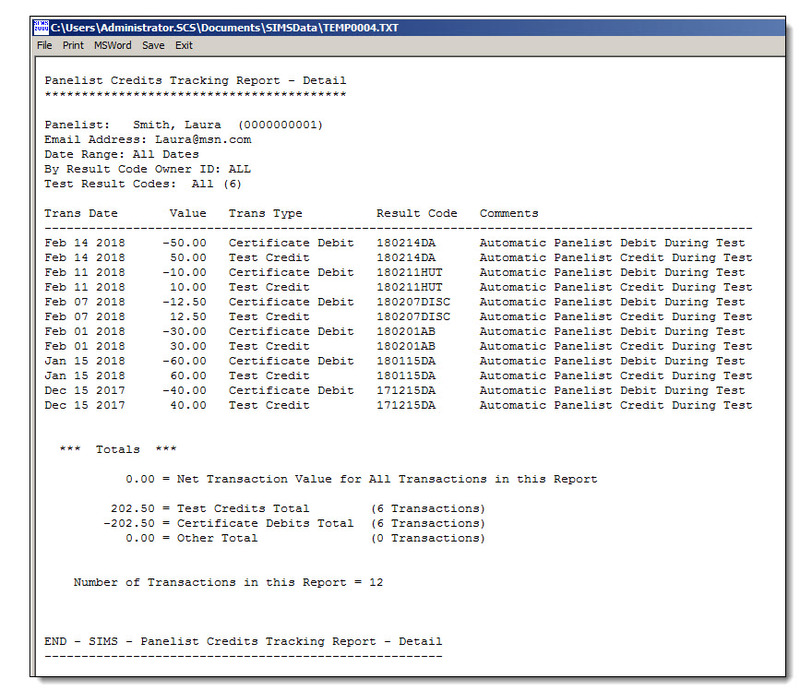 6) System Test Result Credits Tracking - Summary, by a given SIMS Test Result Code. 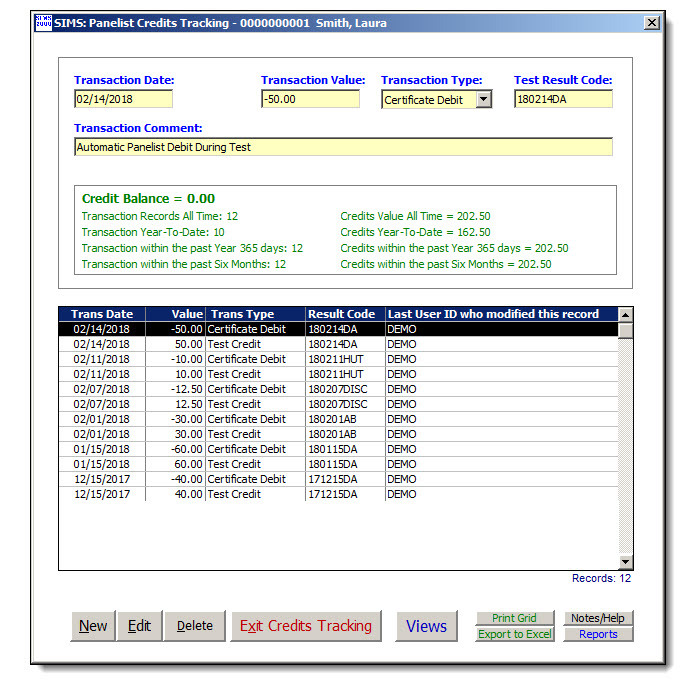 7) System Test Result Credits Tracking - Detail, by a given SIMS Test Result Code. For all Panelists. One line per panelist. Transaction Date = The actual Date of the Transaction. Transaction Value (Positive Or Negative) +/- 9999.99 Maximum. Credits have to be Positive. Debits have to be Negative. Other can be either Positive Or Negative. Transaction Comments, anything you want, 255 text characters Maximum. Result Code - SIMS Test Result Code involved, NOT Verified ! You may have deleted a SIMS2000 Result Code, but still want to reference it. Please be sure to enter the CORRECT desired SIMS Test Result Code. 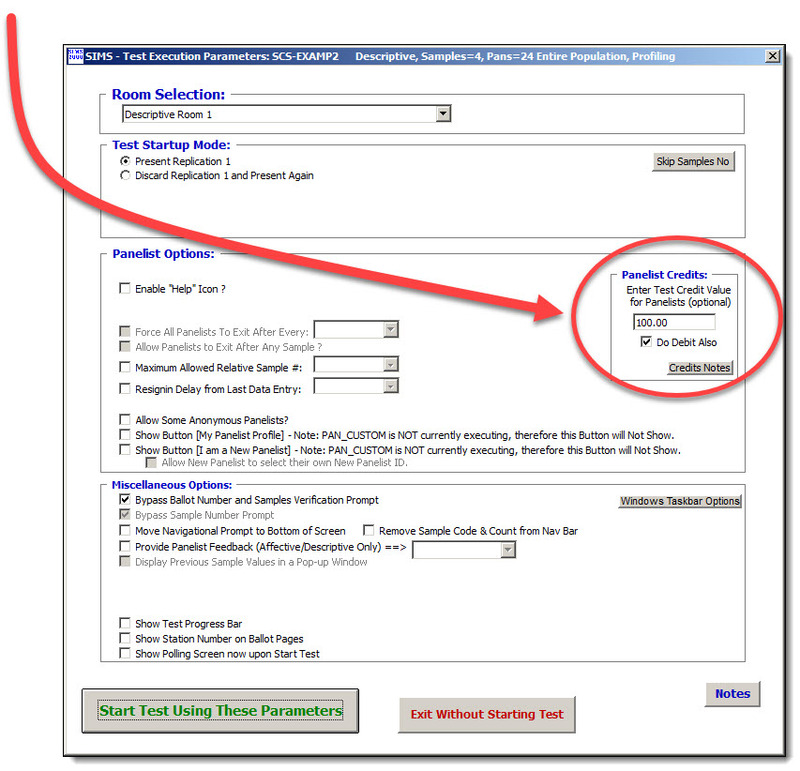 A small Warning will be displayed if a matching Test Result Code is not found. Last User ID - This SIMS Technician User ID who modified the record most recently. This will be equal to the PANELIST ID if no manual modification occurred. Modified Date - Date of Last User ID. Environment User Name - From the Windows Operating System, the Login Name. Environment Computer Name - From the Windows Operating System, the Computer Name. Original User ID - Original User ID, or PANELIST ID who created the Record. Original Date - Date of Original Creation of the Transaction. Anonymous Panelists - Test Result Ballot Number. Required for unique identification of Panelist in Test.